The animal rescue team at the Atlanta Humane Society is dedicated to saving the lives of dogs and cats across the U.S. Because we know that an animal’s need for assistance should not be limited by its location, we travel across the country, investing in the care of animals in areas lacking animal welfare services. From hurricanes to puppy mills, the H.E.A.R.T. animal rescue vehicle has traveled throughout Georgia and the southeast to provide treatment to animals in need that would otherwise go untreated and unprotected. In 2009, the AHS founded the Humane Emergency Animal Rescue Team (H.E.A.R.T.) Team, which is supplemented by a fifth wheel trailer and a knowledgeable response team. Our animal rescue program ensures that animals across the state and country receive the best care possible. We have trained our team extensively, focusing on issues such as All-Hazard Response, Evidence Collection, National Incident Management System, and Fractious Animal Handling. They are also equipped to remove animals from puppy mills, dog-fighting rings, hoarders, and disaster areas. We rely on the public’s support and generosity to operate the HEART animal rescue team. Please consider our sponsorship opportunities or make a donation to our abuse and disaster efforts. Your donations ensure that we can help animals across Georgia, the Southeast, and beyond. The efforts of the Atlanta Humane Society are not limited by City, County or even State lines. We know that an animal’s need for assistance shouldn’t be limited by their origin. As such, we have invested in the care of animals in areas that don’t readily provide animal welfare services. The H.E.A.R.T. team responds to the rural areas of Georgia and beyond to remove animals from puppy mills, dog fighting rings, hoarders and disaster areas. The H.E.A.R.T. consists of Atlanta Humane Society staff members that are specifically trained to respond to mass-animal cases. The Atlanta Humane Society also partners with Norred and Associates in our efforts to eliminate dog fighting. 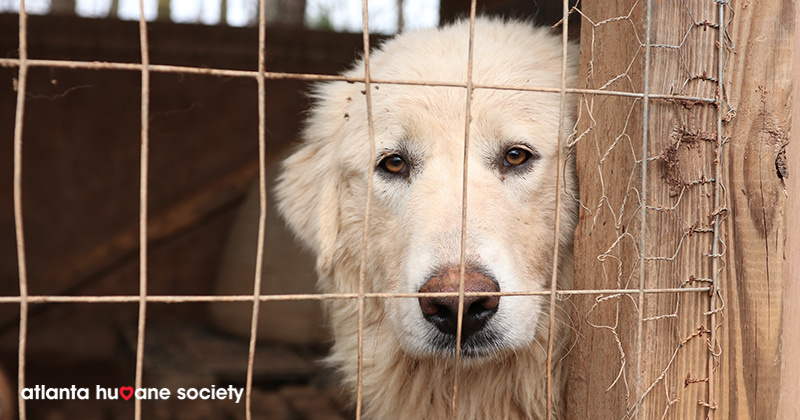 Along with their team of top-tier qualified investigators, we seek out cases and work with local authorities to remove dogs from these horrific operations. H.E.A.R.T. members are efficient, well-trained professionals that work hard to make an impact on some of the worst acts of cruelty in the animal welfare profession. Atlanta Humane Society counts on the public’s support to insure that that our H.E.A.R.T. keeps pounding. The Humane Emergency Animal Rescue Team Vehicle is a 45-ft. long, 14,000-pound 5th wheel mobile animal clinic outfitted for saving animal lives. At first peek, the RV may appear to be comfortable mobile living quarters for our rescue team. Inside however, you’ll find a wide array of assets built specifically to help animals in disasters, puppy mills, hoarding cases, and dog fighting raids. On board the mobile animal clinic you will find: medical supplies, Haz-Mat suits, animal handling equipment, water rescue gear, and much more. The H.E.A.R.T vehicle not only helps transport our qualified emergency animal rescue team around Georgia, but also serves as a mobile incident command center, triage unit, and staging area. WHY A MOBILE ANIMAL CLINIC? The mobile animal clinic has been seen in states including Georgia, Texas, and Florida as it continues to transport our emergency animal rescue team to address the plight of animals in need. In over a year, the vehicle has traveled around the Southeast to assist wounded and neglected animals from dog fighting, hoarding, and puppy mills. Hundreds of animals in all areas of the region suffer from neglect and abuse every day, and too often, local shelters are simply unable to keep up with the demand for animal rescue services. With the mobile animal clinic, our emergency animal rescue team is able to respond to all types and sizes of animal welfare cases. Sponsorship opportunities of all levels are still available for the H.E.A.R.T. Vehicle. Sponsorships are a great way to let the entire region know that you or your company cares for our companion animals. For additional information, please contact one of the skilled animal rescue program staff at the Atlanta Humane Society.